Studies have shown that companies with higher levels of gender diversity have stronger financial performance, stronger governance practices and a more engaged workforce. Investors of all types have been putting pressure on corporate boards to increase the number of women on their boards through numerous avenues, including letter-writing campaigns, direct conversations with board members and the submission of shareholder proposals. However, the pace of change has been slow, and larger companies in the U.S. have been making most of the changes. In the absence of significant, market-wide movement, independent groups and state legislators have taken action. Most notably, on September 30, 2018, California’s Governor Jerry Brown signed a first-in-the-nation bill that requires publicly traded companies headquartered in the state to have women on their boards. This article discusses the history of the bill and the current state of gender diversity in California boardrooms. In 2013, the National Association of Women Business Owners chapter in California worked with State Senator Hannah-Beth Jackson (D–Santa Barbara) to put forth a non-binding resolution. Senate Concurrent Resolution 62 called on boards of publicly traded companies based in the state to increase the level of gender diversity among the members of boards of directors over a three-year period. 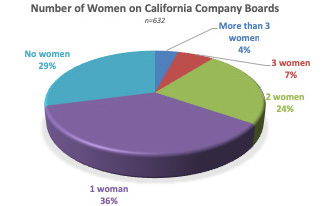 Specifically, California companies were to have a specified number of female directors (ranging from one to three), depending on the size of the board, by December 31, 2016. However, there is no evidence that the resolution drove change; in fact, less than 20% of the Russell 3000 companies headquartered in California met the goals set forth in the resolution by the end of the three years. Undeterred, Senator Jackson introduced Senate Bill 826 (“SB 826”), named for the date when the 19th Amendment was ratified giving women the right to vote (August 26, 1920). California Senate President pro Tempore Toni Atkins (D–San Diego) was a co-author of the bill, and Assemblywoman Lorena Gonzalez-Fletcher (D–San Diego) signed on as co-author as the bill moved to the Assembly floor. The bill was heard in the Banking and Financial Institutions Committee, the Judiciary Committee, and the Appropriations Committee in both chambers of the California Legislature. Despite facing opposition from the California Chamber of Commerce and other industry associations, SB 826 was passed by the California Senate with a vote of 22 to 11 on May 31, 2018. In the California Assembly, it passed with a vote of 41 to 26 on August 29, 2018. The Governor signed the historic bill into law on September 30, 2018. Will the California Law Make a Difference? SB 826 requires that companies headquartered in the state and traded publicly on a major stock exchange (i.e., the NYSE or Nasdaq exchanges) (referred to as “California companies” hereafter) have at least one female director by December 31, 2019. Furthermore, by December 31, 2021, California companies must have three or more female directors if their boards have six or more members and two female directors if their boards have five directors. If a company has four or fewer directors, which is relatively rare, the board must include one woman. If companies are not in compliance with the law, the Secretary of State will assess fines in the amount of $100,000 for the first offense and $300,000 for the second offense. Preliminary findings from a forthcoming study by Board Governance Research LLC show that there are currently 632 companies headquartered in California and traded on the NYSE or Nasdaq exchanges, and therefore subject to the bill. Nearly one-third (29%) of these companies have no female directors. In other words, there are 184 companies that must add a woman to their boards by December 31, 2019. Given recent concerns over a lack of diversity in Silicon Valley, it might be expected that the high prevalence of technology companies headquartered in California contributes to the lack of board gender diversity. However, the following chart shows that the technology companies do not have the least diverse boards in California. Capital goods and healthcare companies are more likely to have all-male boards. The lack of diversity in the healthcare industry is heavily influenced by the prevalence of all-male boards in the biotech industry, which is a dominant industry in California. Notably, based on current board composition, only 12% of companies subject to the California law are currently in compliance with the requirements for the December 31, 2021 deadline. Companies already in compliance include Chevron Corporation, Cisco Systems, Inc., Sempra Energy, Williams Sonoma, Inc. and Zynga, Inc. However, in order for those California companies not in compliance to avoid fines, more than 1,000 board seats will need to be filled by women over the next three years (assuming current board sizes). All eyes will be on California to see if the companies headquartered there add women to their boards to comply with the new law. If companies comply and other states follow California’s lead, the U.S. statistics for board gender diversity will undoubtedly improve and more women will be given the opportunity to serve as corporate directors, many for the first time. Additionally, companies around the country may benefit from diversity around the boardroom table, which in turn can lead to success for all stakeholders.